FAQ’s are typically a part of the website where you can find answers to frequently asked questions about a product or service. At Duthie Power Services, we’re turning the FAQ section on its head and outlining the FAQ’s we typically have for you, our rental generator client. Typically our clients need 120/240 single phase, 120/208 3-phase or 277/480V 3-phase. There are other options, as well, so this is a very important detail to determine. How much electrical current you will need. Amperage and voltage help determine the number of cables per leg as well as the size of the generator you’ll need. Cable comes in 50′ sections. You may need multiple cables per leg depending on the amperage load. What are we powering up? Our rental technicians are available for installation, maintenance, refueling and monitoring. Are there any obstacles such as walls, stairs or fences? Will you need us to fuel the generator? If you experience a long power outage, chances are you will need to re-fuel. Who is our main point of contact? Who is our point person for service approvals and work verification? Do you have a Tap Box? If you’re unfamiliar with Generator Quick Connect Tap boxes, we highly suggest you install one for fast connection to a mobile emergency generator. Mounted to a building’s exterior and electrically connected to a manual or automatic transfer switch, Tap boxes make connecting emergency power faster and safer in the absence of a permanent generator. This is what we need to know in order to provide a quote for a rental generator. We hope these FAQ’s help you feel more prepared when the unexpected strikes and leaves you without power. Our live operators are always available for any additional inquiries. Duthie Power Services guarantees a 15-minute telephone response time with a typical 2-hour on-site arrival (depending on location)- 24 hours a day, 365 days a year. 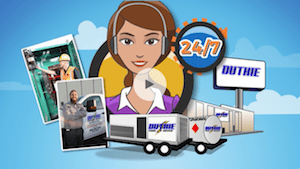 To find out more about our rental fleet and our rental department – visit our main rental page at https://duthiepower.com/rental-emergencies/ where you can see a short video on our rental services.